Only a halfmarathon – but no walk in the park. I had hoped the rather cold weather would last one day longer – but no, right on halfmarathon Sunday (April 25th) the sun started blazing and temperatures started to go up right from the morning (over 20 °C around noon). And maybe it was not such a good idea to run almost the whole route 10 days before (into a cool evening) and two times 10 k over the next few days plus some biking. Plus too much coffee (acidity). So on half marathon day my legs felt like lead most of the time and with my body weight and the heat I was run-walking at an ultra-marathon pace, happy just to finish within the cut off under 3 hours (last year: 2:31). I had even played with the thought of only doing part of the half marathon and stop at my place at km 14, and run the last third by myself in the evening. But I was taking it easy and chatting to some other runners at the back of the pack every now and then – and there was no good reason to stop. People were just so nice – encouraging, cheering, offering food, water etc. even outside the aid stations – how could you drop out? I always love this feeling of togetherness in events like these. You don`t just run by yourself. You always run “together”. I had to walk more than usual, though, and took the time to get myself completely drenched by a couple of cold showers offered by people with their garden hoses, one on Philosophenweg and another one up on Schloss Wolfsbrunnenweg a mile or so before the Castle. They really helped me survive. Near the finish, a helper started to pace me on his bike, telling me we would make the cut off of 3 hours. I had not paid any attention to time, but was actually positively surprised. I finished just behind a 70 year old runner who I had overtaken when he had gotten cramps, but he outsprinted me in the end (my net time was still faster than his, however…). At the same time, the 6 and 10 day Self-Transcendence Race in New York was still going on (this year the weather was extremely hard for the runners over there). Still I would really love to have the experience of a multi-day race one day. Longer distances have a totally different quality, but with running my physical was always too limited. That is why the Channel tempted me, 25 years ago. And now again. Who knows, maybe in a couple of years? 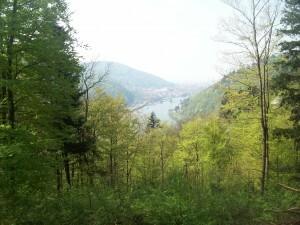 My next humble goal is 80 km (my running distance for September) in Basel on May 8/9. On Sunday, during the Heidelberg halfmarathon, I was thinking a lot of my friends who are challenging themselves in the 6- and 10-day Self-Transcendence-Race in New York. That makes 21,0975 km feel so short! Still I knew it would not be easy, but I wanted to enjoy the journey. I had not done any serious really long runs since last year’s triathlon training, and I am at least 5 kg heavier than last April, plus one year older.. The course is hilly with a number of steep sections and the sun would be blazing part of the way… So my only goal was to focus, stay happy and hopefully finish under 2:45 (I am a slow runner anyway). And I totally enjoyed the run. The 3500 runners started in blocks to fit through the narrow streets and forrest paths. I was way in the back. In the beginning my running was so slow, I saw the “Besen-wagen” (pick up van for the drop-outs) only a few hundred meters behind. At the end it only took me 3 minutes longer than last year – not bad! And I felt strong – the Channel training is still there. However, with no serious sports challenge since last year I had almost forgotten the inner joy and intensity they give. It was like a wake-up call. “Run and become” – a phrase my teacher Sri Chinmoy coined, is so true! (Of course also for swimming etc.) Setting goals is important to challenge oneself, but the main thing is happening along the way. I love the many special training experiences – sometimes mystic or ecstatic, when you are running into the rising sun or under the stars, the purified feeling after a swim workout and the intense feeling of inner peace and vastness after a bigger challenge which may stay for days or weeks or even months (like after my first ultra-triathlon in Australia) – this is what for me sports is all about. A form of meditation, or an intensification of meditation, a door to inner experiences. So the half-marathon was tough as usual, but also tremendous joy. A great feeling of oneness – oneness with the other runners, with the cheering, clapping, drumming supporters along the route, offering water and food at private stations, with the beauty of nature and the scenic route. Not sure what my next event will be. Last year was very different – I took all ultra-opportunities without question. This year I am going with the flow, right now I still have to concentrate on my work. But May will show how serious I can become this year about my project. This is one of the most tricky things about the triathlon project: finding just the right balance between heat and cold tolerance. 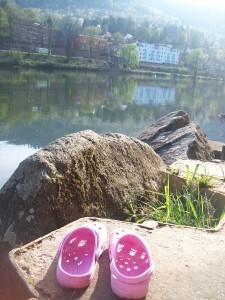 After my run, I changed into my bathing suit (and some more clothes) and went down to the Neckar. It was incredibly peaceful, no soul around in spite of the holiday (Good Friday), hardly any clouds in the blue sky, the water much clearer now with the dry weather, but still not inviting enough for me to put my head into it. It was easy to stay in for 30 minutes, it must be over 10°C now. I love it, even though it is not real training – breaststroking against the current. Some people passed by and asked about the temperature – I suppose it must have looked quite tempting to take a dip. Since I am staying in Heidelberg over the Easter Holidays, which is quite unusual, I might just as well use the great weather and make it a new habit to swim every day/morning in the river, as long as it is still moderately cold. No danger anymore that people will call the police, I suppose. Update – and Oceans 7 victory for Abhejali! Karteek did it again! EC solo no 11! 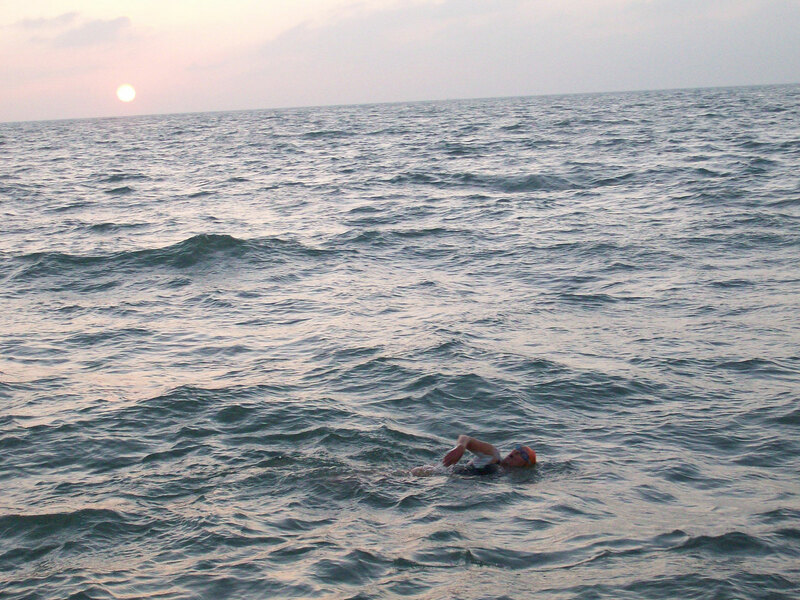 | English Channel Triathlon Dover-Heidelberg on Adriano Passini – our team`s new English Channel swimmer! the goal will be all yours.